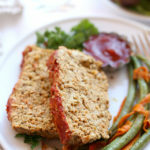 Meatloaf with oatmeal and lots of vegetable pureed together makes this heart healthy turkey meatloaf recipe a meat-lovers favorite! For the past week the boys have had colds and waking up every night to sneak into bed with the hubby and I. Since they share a room they think it is a great idea to wake each other up before trampling on the hard wood floors in an effort to “quietly” sneak into our room. After the third night of their little adventures it was time to reprogram their sleeping patterns. Sounds like someone might want to be a farmer! That day the kids chose meatloaf for dinner. 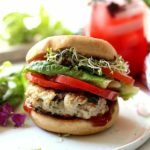 With our little colds running through our bodies I wanted to ensure they would eat veggies alongside a turkey meatloaf recipe. The most enticing way is to hide the vegetables in the meat. Chopping takes way to much time plus the texture of “chunks” are sometimes unappealing to children (and my husband too!). Did you know meatloaf is actually a traditional German dish, cousin to the Duch meatball. 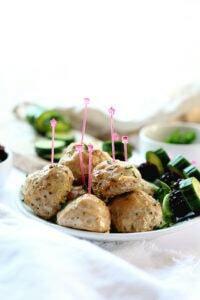 That is why if you are looking for meatloaf recipes, meatballs come up in searches too! Meatloaf originated back to Roman times and became popular during the time of the Depression. 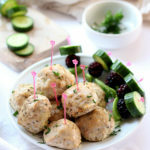 It is a dish that extended the use of meat by adding fillers such as breadand oats. 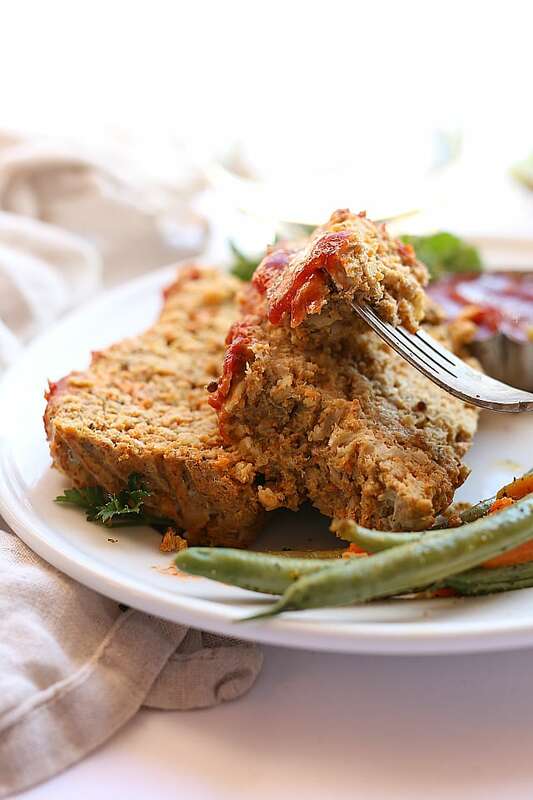 For an easy Veggie-Packed Turkey Meatloaf Recipe toss egg whites, onion, carrots, garlic, ketchup and kale into a food processor and puree until smooth. There is also nutritional yeast added in the recipe. 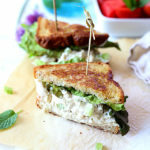 Nutritional yeast is packed with energy boosting B-vitamins and adds a little punch! to the flavor! Hubby and I couldn’t stop cracking up an at the wandering food! 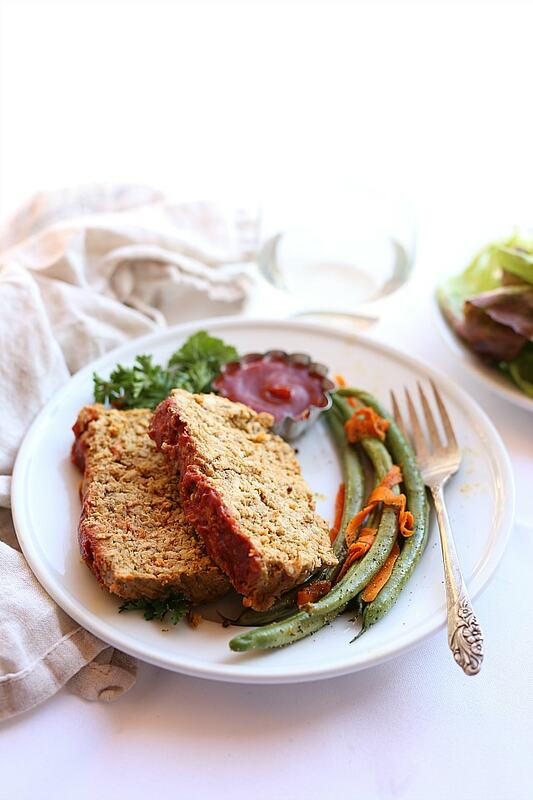 But the whole family ate seconds and the little got their full serving of vegetables, whole grains, protein and B-vitamins all from this turkey meatloaf recipe! Preheat the oven to 350 degrees F. Spray a 8.5 inch loaf pan with cooking spray. In a food processor add the egg whites, onion, kale, carrots, 2 cloves of garlic and ketchup. Process until smooth. 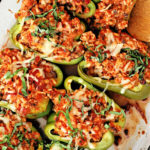 In a large mixing bowl add the processed vegetables, ground turkey meat, oats, nutritional yeast, salt, pepper and beef rub seasoning. Mix with your hands squeezing and squishing together until it is completely mixed. Place into the prepared loaf pan and make sure it is evenly spread out. Drizzle the top with extra Ketchup. Bake at 350 degrees for 45-50 minutes. While the meatloaf cooks make the garlic green beans. Wash and snip off the ends (if preferred). Sautee on the stovetop on medium-high with 1 clove minced garlic and 1 tablespoon olive oil for about 7 minutes or until slightly soft and browned but still crispy.